If you are on facebook, You must also used to do chat with your friends,relatives and loved ones.The facebook ,by default,supports only single font for chat.If you are bored of same boring black text,there is something new for you to try. In this post ,I am going to tell you a way using which you can send colorful text while chatting. However, you cannot use this colorful text in long conversations because it will be quite time consuming and tedious process.But ,surely,you can impress your friends by sending some special messages in colorful text.So without any delay,I’m going to tell you how it works. Type the text you want to send in the first box labelled”Type here”. As soon as you type,the correspond code for that text will appear in the box given below. 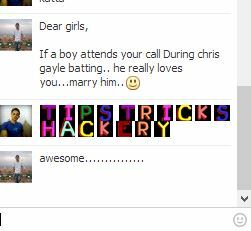 Just copy the code and paste it in facebook chat box. Your message will be delivered in colorful font. You can preview your entered text in the last box.